From page 69 of the report. Photo by WFP/ Teresa Ha in Khram wa Sarbagh, Wakhan. Climate change in Afghanistan is not an uncertain, “potential” future risk but a very real, present threat— whose impacts have already been felt by millions of farmers and pastoralists across the country. In this report, we show how drought and flood risks have changed over the past thirty years, and what impact this has had on rural livelihoods and food security in the country. The aim is to inform national-level prioritisation of areas and livelihoods groups for climate change adaptation and disaster risk reduction programmes. The poorest people—particularly subsistence farmers and pastoralists who are often already living on marginal land—are also those who suffer most from climate change. Yet it is difficult to get an overall, national-level understanding of where the impact of climate change on food security and livelihoods are most worrying and need to be addressed most urgently. This report* focuses not on “where have droughts or floods become more frequent and severe?”, but rather “where has the impact of droughts and floods on livelihoods—and ultimately food security—been most severe?” To answer this question, climate information was combined with detailed livelihood zoning and hazard analysis to obtain an overview of which areas and population groups are most vulnerable to climate change. The report also describes future risks under a changing climate. From page 5 of the report - “hotspot areas”, i.e. livelihood zones where each of the hazards analysanalysedhashe largest impact on livelihoods and food security, over the past thirty years. (For more detail right-click to open in new tab/window). riverine floods caused by heavier and faster upstream snowmelt in the highlands. For each of these four hazards, the report maps out where the hazard has become more severe over the past thirty years (e.g. see the food insecurity map below), as well as where livelihoods were most sensitive to it. These maps were then overlaid to highlight “hotspot areas” —i.e. livelihood zones where each of these hazards has had the largest impact on livelihoods and food security, over the past thirty years. The results are shown above and on page 5 of the report. A livelihood zone is an area within which people broadly practice the same type of activities to obtain food and income. The livelihood zones used here (see p.14 of the report) were developed by FEWS NET in 2011, in consultation with the Afghan government and development partners. Climate models were also used to look at how the risk associated with these four hazards is expected to change in the next thirty years— keeping in mind the high level of uncertainty associated with such climate projections. A detailed methodology is given from page 10 of the report. From page 24 of the report: Food security trends over the past seven years: recurrence of food insecurity above 30%, 2007—2014. Livelihoods in Afghanistan are heavily based on farming and livestock, which together account for about 45% of the active population, and are a source of income for over 60% of all households (and the primary source of income for 28% of households). Notable exceptions are areas along the border with Iran and Pakistan—where cross-border trade and migration dominate– and in urban areas (which account for about a quarter of the population). Wheat is by far the most important crop produced in all areas, though its relative importance is higher in rainfed than in irrigated areas—where other crops are much more common (particularly fodder crops, potatoes, maize, sorghum, fruits and vegetables). A distinctive feature of Afghanistan is that irrigation water flows depend not just on rainfall, but also to a large extent on snow and glacier melt. One often overlooked impact of climate change on food security is its impacts on the length of the growing season: shorter growing seasons in rainfed areas means that only one major crop can be harvested per year, instead of two. Cropping intensity—or the ability to grow more than one crop per year, is an important determinant of rural food security. Livestock is also a key source of income and food for many households, either as a supplement to farming, or as the main livelihood—especially for the nomadic pastoral Kuchis. Unemployment and underemployment are a major issue in Afghanistan— affecting close to 40% of the total working-age population. Women are particularly affected: over half of women who are of working age and seeking employment are either underemployed or unable to find a job at all (1.1 million people). This is in addition to the 71% of women (5.4 million) of working age who are inactive and not seeking employment. This means that 85% of the female working-age population (6.5 million people) is either unemployed, underemployed or inactive. This compares with 47% of working-age men. Between 2007 and 2013, the female unemployment rate almost doubled, in both urban and rural areas. Interestingly however, the inactivity rates over the same period have followed opposite trends in urban and rural areas. This suggests that active women (i.e. who are employed or seeking employment) are finding it harder to find a job in both urban and rural areas. However, the number of women who actually want to work is increasing in urban areas but decreasing in rural areas. This likely reflects the fact that working is becoming more and more socially accepted for women in cities, but less accepted—and less safe—for women in rural areas. 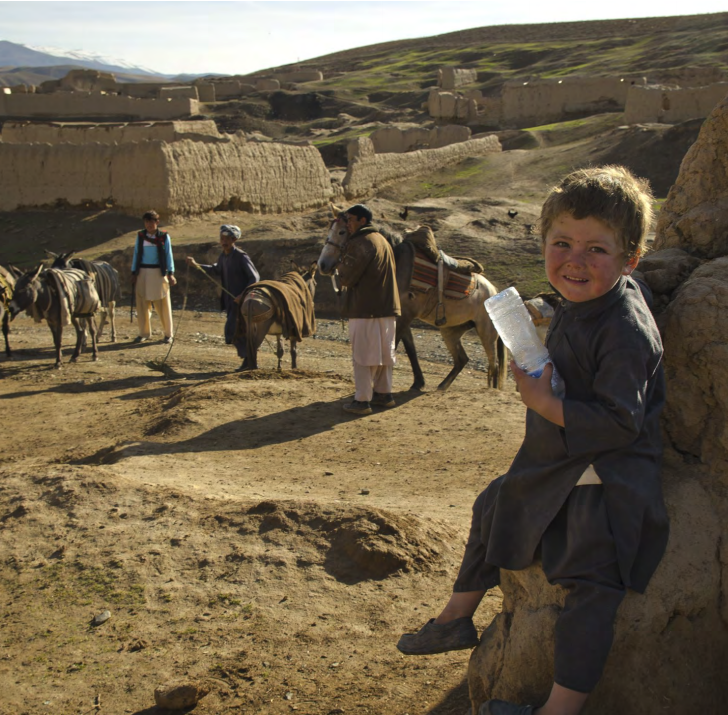 In rural Afghanistan, the majority of rural households’ income is derived from agricultural production – either from the sale of their own production, or from wages. Food insecure households are most dependent on markets: in rural areas, 80% of severely food insecure households buy most of their food, compared to only 66% of food secure households. Over the past thirty years, the impact of increased rainfall-related drought risk on food security and livelihoods has been most severe in the north and center of the country. These are areas where the decline in spring rainfall overlaps with high livelihood vulnerability to lack of rainfall. Whereas drought in rainfed areas is primarily caused by lack of rainfall locally, drought in irrigated areas is in large part linked to climate conditions further upstream. Spring and summer water flows in all three of Afghanistan's main irrigation systems— rivers, karez and springs— depend to a large extent on the amount of snow that falls the preceding winter in the Hindu Kush mountains or the Central Highlands, where these systems originate. The threat posed by drought to the sustainability of the country’s irrigated farming is already acutely visible: in 2014, an estimated 31% of the total land normally available for irrigation was uncultivated—mostly due to lack of water in river and water-basin irrigation systems. The irrigated areas around Kabul, which produce much of the country’s grain and vegetables, have been particularly affected. Future climate projections suggest that the main negative impact of climate change in Afghanistan in the future will be increased drought risk— with increased flood risk being of secondary concern. Annual droughts in many parts of the country will likely become the norm by 2030, rather than being a temporary or cyclical event. This will mostly be due to higher temperatures leading to higher evapotranspiration and higher crop and livestock water demand. This report was produced jointly by the World Food Programme (WFP), the United Nations Environment Programme (UNEP) and Afghanistan’s National Environmental Protection Agency (NEPA). The authors would like to thank FEWSNET, who produced the livelihood zones and profiles used in this report, under their Livelihood Zones Zoning “Plus” Activity. The production of this report has been made possible through the generous contribution of the Government of Sweden through the C-ADAPT initiative. The Climate Adaptation Management and Innovation Initiative (C-ADAPT) is a strategic global initiative that aims to strengthen the capacity of the WFP and partners to deliver climate services to the most vulnerable and food insecure communities and build resilience to climate-related risks through effective climate risk analysis, adaptation planning, and risk management. C-ADAPT is funded by the Government of Sweden’s fast-track climate finance. World Food Programme (2016) Climate Change in Afghanistan: What Does it Mean for Rural Livelihoods and Food Security? Rome: World Food Programme.